When Judah Jackson is released from prison he has exactly a bag containing two pairs of pants, a shirt, some underwear, socks and $300 in cash, a far cry from the wealthy man who entered prison convicted of insider trading. At first, Judah thinks it will only be a matter of time before he is working and getting his business back together. But soon the reality of his situation and new life as a ex con sets in. No one will hire him and without an income he loses his apartment and ends out on the streets, vulnerable, angry, and alone. Tobias Simonsen has been homeless for over a year and finds that he has almost adjusted to his status as a man without a job or place to call his own. Not even his degrees and experience in the restaurant business have been enough to save him from his current life and he is now beyond despair that it will change. Then he saves a man being beaten in an alley, a man once wealthy and now painfully unable to fend for himself on the streets of Ashville. Together Judah and Toby find a connection that begins to lift them up into friendship and then something more. When their relationship starts to heal the wounds for both men, they start to hope for a future together. Then a change in one man’s situation starts a chain reaction of emotions and events that could shatter their bond forever. Will their faith in each other and their love keep them together even when reason tells them they will part? What a moving and timely story from Ally Blue! Long the Mile focuses on the plight of homeless, a heartbreaking statistic that is rising throughout the nation, especially in these economic times. Instead of faceless numbers Ally Blue takes this tragic reality for so many and brings it down to an intimate and relatable level with the characters of Judah and Toby, two men of different backgrounds and education who end up in the same landscape of homelessness and despair. This is a tough topic to use as a center for a romance, especially if one of the men is also someone whose criminal conduct and arrogance got him convicted of a felony and sent to prison. Our first introduction to Judah Jackson is a risky one on the part of the author. Judah is angry, still arrogant, and not especially sorry that he committed a crime, only that he got caught. Think of the white collar criminals such as Kenneth Lay of Enron and you can see how such a character might invite scorn instead of sympathy. But that sneering man we meet as he is leaving prison is soon to get a shocking comeuppance as Judah tries to find a job while his small pocket of funds dwindles. Ally Blue takes us into his mindset as Judah unravels emotionally and physically until he finally runs out of options and ends up on the streets of Asheville. It is a scary picture, made all the more real by the author’s authentic descriptions and her clear understanding of the humiliation, despair and fear that is the constant state of those who are homeless. To balance out the picture she is creating, Blue then gives us Toby Simonsen, an educated young man who was working on his career, with a bright future ahead of him until the economy crashed along with his job. With all hotels and service establishments in trouble, the jobs vanished and so did the hopes of thousands of people along with them. I loved Toby and my heart broke for him because we understand that Toby has given up after a year on the streets. The constant search for work as well as the constant rejection wears upon the soul and only the goodness and understanding of Father Bill and the shelter at Holy Innocents has helped to save him. Ally Blue has endowed Toby with an inner strength that feels real, born out of need and Toby’s innate goodness. Toby is definitely the easier of the two men to connect with. Slowly over the course of Long The Mile, the real inner Judah starts to appear along with his history that makes the man he became at least understandable if not always likable. And the reader needs that in order to accept Toby’s attraction and eventual love for Judah. If this story has an identifiable weakness, it arrives in the latter part of the book when a event arrives that threatens to tear the men apart. I think the situation that signals a change in their lives is a perfectly realistic one as is its separate effect on each of them. My only quibble is that Toby seems a little oblivious to what a change in the dynamics would have on Judah with his background. I kept thinking that perhaps a little more exposition and length would have helped alleviate what felt like a rushed resolution to a terrific story. But that quibble aside, Long the Mile is a timely tale no matter what time of year it is. With its focus on a homeless population that is ever present, Ally Blue has brought this tragedy home and given it two faces we can identify and sympathize with. When you add the fact that young LGBT youth are a large part of that statistic through no fault of their own other than being gay and the shame and horror deepens. I highly recommend this book to all based on its own merit as a heartwarming romance. 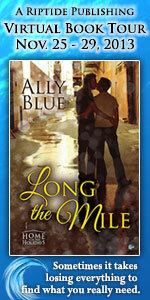 But Ally Blue and the publisher just made it easier by donating 20 percent of all proceeds to the Ali Forney Center. So run, don’t walk and grab it right up. 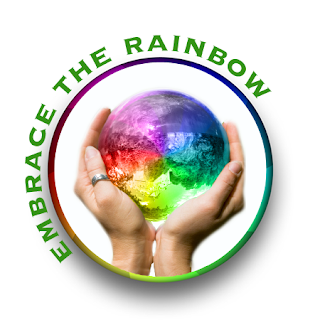 You will be getting a wonderful story and helping LBGTQ youth as well. 20% of all proceeds from this title are donated to the Ali Forney Center in New York, whose mission “is to protect lesbian, gay, bisexual, transgender, questioning (LGBTQ) youth from the harm of homelessness, and to support them in becoming safe and independent as they move from adolescence to adulthood.” To learn more about this charity or to donate directly, please visit http://www.aliforneycenter.org/. This entry was posted in Book Reviews, Books, Contemporary fiction, eBooks, LGBTQ Book Reviews, M/M Book Reviews, M/M Contemporary Fiction, M/M Fiction, M/M Romance, Riptide Publishing, Uncategorized and tagged 20% of all proceeds donated to the Ali Forney Center, Ally Blue, Ally Blue guest blog, friends to lovers, gay homeless men in fiction, Long the Mile, Long the Mile book contest and giveaway, lovers reunited, m/m contemporary romance, m/m novel, must read, Riptide Publishing's Home for the Holiday series, Scattered Thoughts Highly Recommended. ScatteredThoughtsandRogueWords is happy to have Ally Blue with us today to talk about her latest release, the moving story Long the Mile for Riptide Publishing. We have a contest to go along with Ally’s guest blog. The contest details and the Rafflecopter links are listed at the bottom of today’s post. Now, let’s welcome Ally Blue! When my lovely and fabulous editor, Dr. Sarah Frantz, first contacted me about being a part of this Christmas collection, I was interested for a whole list of reasons. First of all, I already knew and respected Sarah as a romance fiction scholar and as a person, so that went a long way. Also, I’d heard good buzz about Riptide both from a reader and an author perspective. Always a good thing. The thing that probably sealed the deal was that twenty percent of the proceeds both from each individual book and from the collection go to the Ali Forney Center. How could I pass that up? The answer is, I could not. After saying “YES! A thousand times, yes!” the next question was what to write? 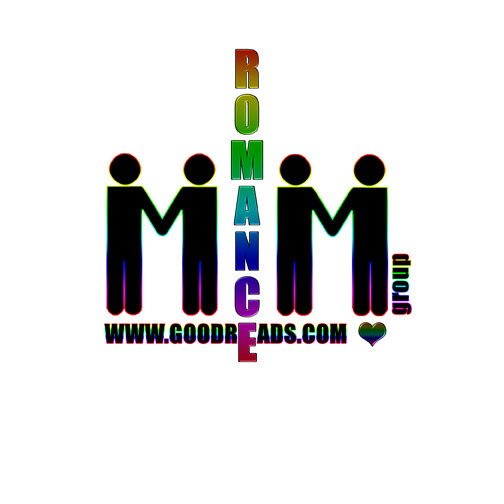 It needed to be a gay (in this case, m/m) romance. It needed to have a Christmas setting, with a theme of “home” in whatever way I wanted to interpret it. When I started pondering, I found that the answer came to me easily. I was going to take the theme very literally, incorporate our chosen charity, and write about homeless characters who are finding their homes again, both physically and emotionally. Thus Judah Jackson and Tobias Simensen were born. The setting was easy too. Asheville is a wonderful, colorful, fantastic city, and like every city, we have too many people living day to day without any permanent shelter. I can’t tell anyone’s true story. All I can do is invent one. Or in this case, two. But I wanted to set this book in Asheville. I wanted to imagine what it might be like for my two guys – one who had been homeless for a while, and one who goes from rich to homeless during the book – to meet, get to know each other, and fall in love while living on the street. I wanted to consider how their situation would affect their relationship, and how that relationship would change when the situation changed. I have to say, I’m pleased with how the book turned out. 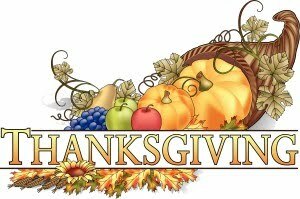 I hope all of you will be too Thank you so much for stopping by to read today! 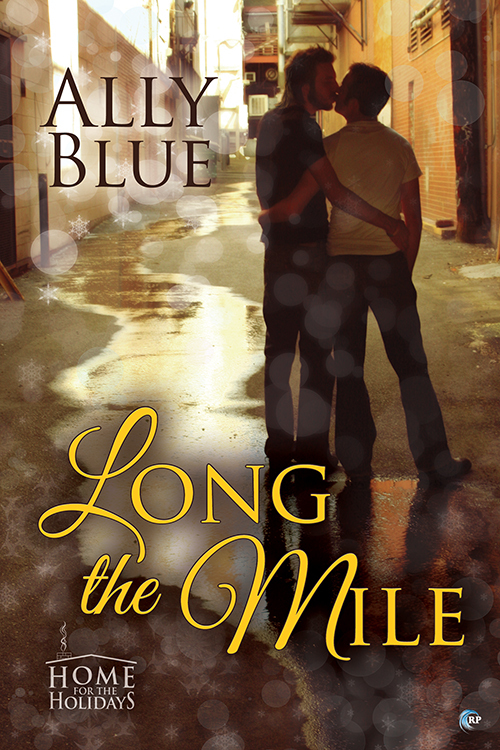 Enjoy Long the Mile, and all the other books in the Home for the Holidays collection! Sometimes it takes losing everything to find what you really need. When Judah went to prison for insider trading, he lost everything he thought was important: his business, his money, his power. But when he gets out, homelessness strips him of the one thing he has left: his self-respect. When another homeless man saves him from a beating, he begins to learn to rely on the goodness of those around him. For Toby, life on the streets has become familiar. Comfortable. So comfortable he wonders if he’s given up on changing his life for the better. Then comes Judah. Formerly rich, newly homeless, all his pride and attitude gone along with his material possessions. Helping Judah feels good. Their unexpected connection—physical and beyond—feels even better. Their shared situation nurtures a growing closeness that blossoms into something deeper. But when change comes knocking, it will take all their strength to keep fear and insecurity from tearing them apart. Ally Blue is acknowledged by the world at large (or at least by her heroes, who tend to suffer a lot) as the Popess of Gay Angst. She has a great big suggestively-shaped hat and rides in a bullet-proof Plexiglas bubble in Christmas parades. Her harem of manwhores does double duty as bodyguards and inspirational entertainment. Her favorite band is Radiohead, her favorite color is lime green and her favorite way to waste a perfectly good Saturday is to watch all three extended version LOTR movies in a row. Her ultimate dream is to one day ditch the evil day job and support the family on manlove alone. She is not a hippie or a brain surgeon, no matter what her kids’ friends say. Comment on this post or any of the other posts in the tour, and you’ll be entered to win an ebook copy of Demon Dog, book one in my Mojo Mysteries series. I’ll pick a winner on December 1st at 5 p.m. EST. Contest is valid worldwide. Enter your details in the Rafflecopter below and leave a blog post comment to gain entry in the *Home for the Holidays* giveaway! This week of the tour closes at midnight, EST, on November 30th. One grand prize winner will be contacted at the end of the tour on December 16th. Contest is valid worldwide. This entry was posted in Book Reviews, Books, Contemporary fiction, eBooks, LGBTQ Book Reviews, M/M Book Reviews, M/M Contemporary Fiction, M/M Fiction, M/M Romance, Riptide Publishing, Uncategorized and tagged 20% of all proceeds donated to the Ali Forney Center, Ally Blue, Ally Blue guest blog, author guest blog, book contest, Book Release Book Tour and Contest, Christmas m/m story, friends to lovers, gay homeless men in fiction, Long the Mile, m/m contemporary romance, m/m holiday stories, Rafflecopter link, Riptide book release contest, Riptide's Home for the Holidays series, Scattered Thoughts Highly Recommended.